As the longest lens in the NIKKOR lineup, the AF-S NIKKOR 800mm f/5.6E FL ED VR delivers an astounding 800mm (1200mm equivalent on DX-format cameras) of super-telephoto reach with a fast f/5.6 maximum aperture in a rugged, well-balanced design. But for even greater reach, the lens includes a matched 1.25x teleconverter (TC 800-1.25E). This high-performance 1.25x teleconverter has an Extra-low Dispersion (ED) glass element for superior sharpness and colour correction, and it increases the lens' overall focal length to 1000mm (1500mm equivalent on DX-format cameras). 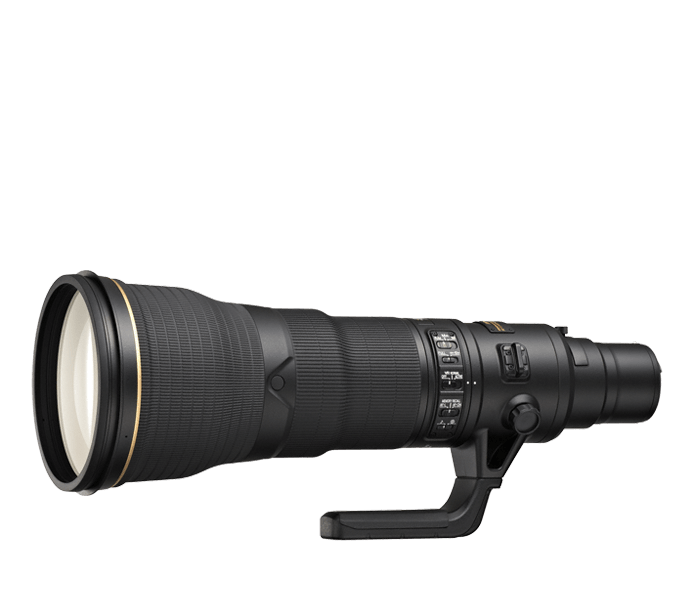 The AF-S NIKKOR 800mm f/5.6E FL ED VR is a marvel of NIKKOR optical design. The lens is comprised of 20 elements split into 13 lens groups. The front and second elements are fluorite (a lightweight mono-crystal optical material), which provides superior optical characteristics and reduced weight for balanced handling. Two Extra-low Dispersion (ED) glass elements provide superior sharpness and colour correction by minimizing chromatic aberration, and Nano Crystal Coat (N) reduces ghosting and lens flare throughout the visible spectrum.